I get this question form my kids a lot: “Mom, why do none of the other kids have pointy arrows sticking through their heads? They have it so much better than I do.” I attempt to point (ahem) out to them that none of the other kids have built-in marshmallow roasting sticks, or are able to pick up litter with the greatest of ease, or can show people the way by craning their necks, or can go pick locks with their heads, but they never listen. It is good to have a an outside, independent source back me up. Knife is so lucky! He gets to cut, he gets to spread. I never get to cut or spread. Amy Krouse Rosenthal and Scott Magoon have put together a great book about acknowledging your strengths. Spoon is about a tiny utensil who is bent out of shape when he compares himself to the skill sets of his friends fork, knife and chopsticks. His mother gently reminds that in comparing himself to others, he is overlooking his own special attributes. Rosenthal has a great way with words in all of her books, and Spoon is no exception. She uses wordplay that can be fun for adults and older kids, but without ruining the flow and the narrative for toddlers. 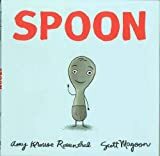 Scott Magoon’s illustrations are playful with subtle textures and clever character inclusions (Spoon’s extended family portrait provides some nice respite to pour over and talk about all the different kinds of spoons).